Time-consuming tool changes disrupt the production flow. That is why experts at WILA are continuously searching for solutions - and with success too! Combining WILA's New Standard top tool BIU-051 with New Standard bottom tool OZU-083 makes it possible to bend and flatten without changing tools. Obviously, this solution will help you to save a lot of time by avoiding having to handle the sheet material twice. 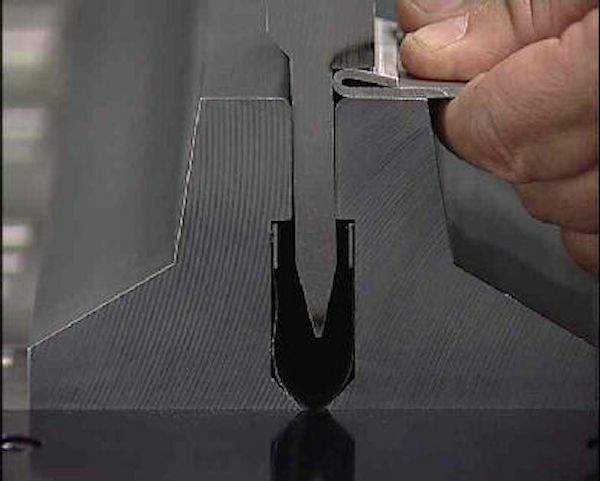 At WILA, we also have additional flattening tooling, including spring-loaded flattening dies as well as hydraulically lifted hemming tables for high production hemming, and flattening dies for thicker materials. The process is the same as in other hemming operations in which you make a 30-degree bend as the first step. The upper beam then retracts, allowing you to remove the part. The second step involves the upper beam coming back down and pushing the punch deeper into the die opening on the die. While the flattening operation is performed differently among the wide variety of hemming dies that we offer, you can always be assured of producing the highest quality finished parts. Depending on the selected tools, these New Standard tool combinations can process materials up to a thickness of 1.5 mm. However, they are particularly well suited for materials with a thickness up to 1.2 mm. At WILA, press brake technology never stands still. We enthusiastically renew and fine-tune our products on a daily basis in order to realize even greater productivity benefits. Would you like to know more about WILA's high quality productivity-improving solutions? We welcome the opportunity to provide you with an in-depth explanation, technical details, or a demonstration.